An artist project currently on display in Dublin uses bacteria from artists, designers, and other humans to make cheese. Called “Selfmade,” the project by biologist Christina Agapakis and artist Sissel Tolaas is part of the bioart-focused Grow Your Own: Life After Nature exhibition at Science Gallery at Trinity College Dublin. The exhibition is all about where our increasingly designed lives might take us, including some rather ominous possibilities like mice cloned from Elvis Presley’s hair (purchased on eBay), possible future species in reaction to a changing earth, and humans giving birth to dolphins. The cheese takes the idea that the bacteria that is integral to the cheese-making process could be taking from the great microorganism that is the human body, creating sort of portraits in cultured food. For “Selfmade” in Grow Your Own, donors gave their personal bacteria through cotton swabs, including those with the tears of artist Olafur Eliasson, bacteria from the nose of curator Hans Ulrich Obrist, a bacteria from the belly button of chef Michael Pollan, and toe bacteria from microbiologist Ben Wolfe. For the Science Gallery we’ve created a series of 11 different cheeses from people who have interesting stories to tell about microbes, about cheese, about food and food cultures, aesthetics and poetics, and the body and its relationship to the environment. By sampling and interviewing scientists, artists, anthropologists, and cheesemakers, we approach the questions at the intersection of human and microbial cultures from many perspectives. 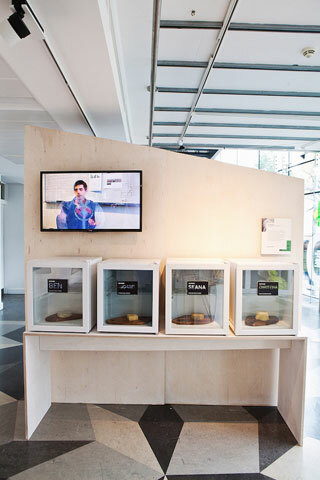 Currently on display in the gallery are four of the cheeses and a short film with interviews of the donors, mostly coming from the perspective of cheese microbiology and artisanal cheese production. During our residency at the gallery last week we made a new set of cheeses with microbial donations from artists, curators, and architects, expanding on the themes we’ve been exploring with a different perspective on culture and the body. Tolaas’ past art has been heavily focused on scent, and reportedly the scents of the cheese match the people, and now combined with Agapakis’ interest in bacteria-exploring art projects those scents can be edible in “microbial sketches” (although don’t get your hopes up about eating Olafur Eliasson’s tears — which we assume tastes “light” — as the cheese are not for exhibition visitor consumption). Where this and the other over 20 projects that make up the Grow Your Own exhibition make you intrigued about exploring an engineered future or make you want to extract your brain with an olive fork, it’s definitely an intriguing form of portraiture for the capabilities of the human organism. Grow Your Own: Life After Nature is at Science Gallery at Trinity College Dublin through January 19, 2013.